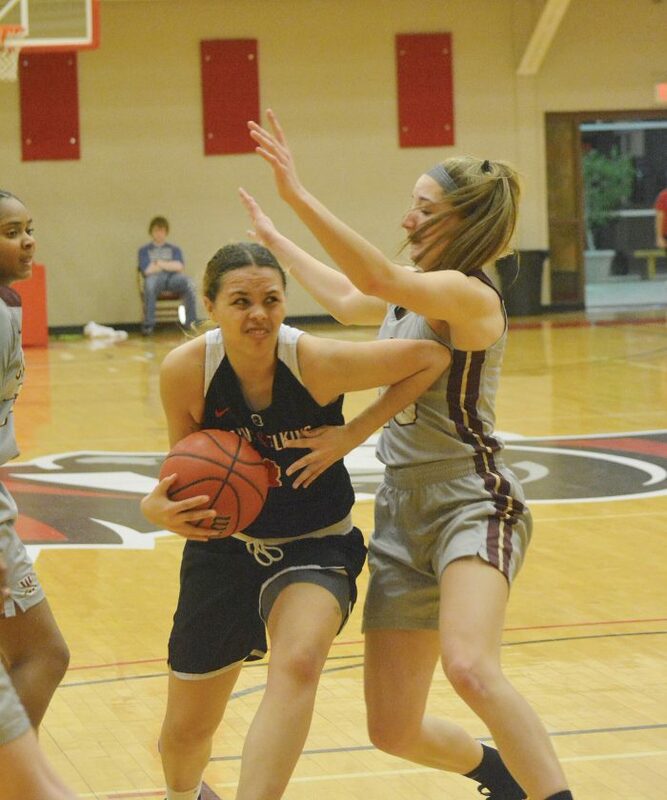 The Inter-Mountain photo by Edgar Kelley Davis & Elkins’ Kali Wilburn gets past a pair of Walsh defenders Thursday night in G-MAC action at the McDonnell Center. ELKINS – Mayci Sales poured in a game-high 20 points to help lift Walsh University to an 81-48 win over Davis & Elkins Thursday night in G-MAC action at the McDonnell Center. Jamie Halloran added 12 points for the Lady Cavaliers (16-6, 12-4), who led 47-23 at the break and 58-41 after three quarters of play. Britini Clopton chipped in nine points for Walsh, while Megan Ball and Quionche Carter hit for eight apiece. Colleena Burdock scored 17 points to pace the Lady Senators (6-14, 5-10). Jamiyah Johnson followed with eight points and six rebounds in the setback. Kali Wilburn and Jay Kilpatrick added five points each for D&E, which hit 19 of 55 of its field goals for 34.5 percent and struggled from beyond the arc, connecting on just 1 of 16 tries. The Lady Cavaliers, meanwhile, were good on 9 of 19 from 3-point land for 47.4 percent and shot 57.9 percent from the floor on 33 of 57 shooting. The Lady Senators will remain home at 2 p.m. Saturday to face Malone, while Walsh visits Alderson Broaddus at 2 p.m. on the same day for another G-MAC contest.